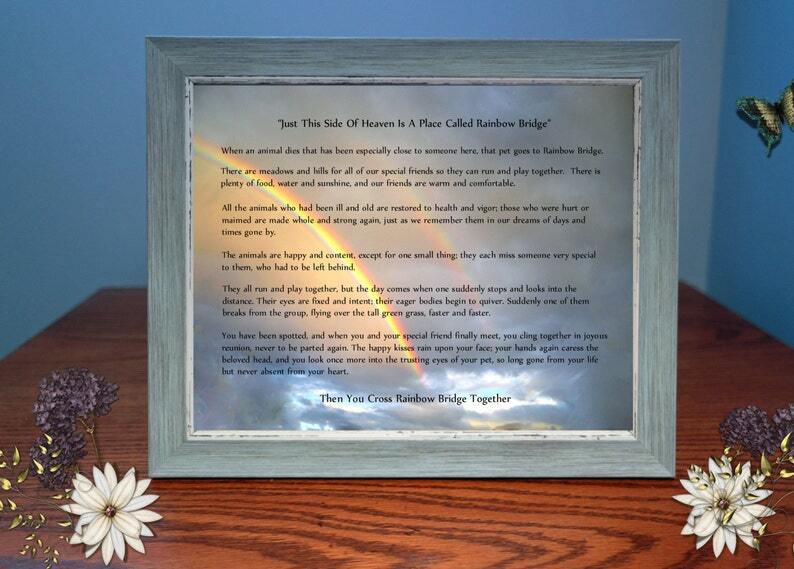 Rainbow Bridge Poem can be personalized with pets name. Beautifully framed photograph and sympathy poem. Send to someone who has lost their beloved pet or keep as a memorial gift. If you want us to place your pets name onto this photo gift - simply provide us with the pets name by clicking on the request a custom order button below the photograph products images. Full poem reads: When an animal dies that has been especially close to someone here, that pet goes to the Rainbow Bridge. There are meadows and hills for all of our special friends so they can run and play together. There is plenty of food, water and sunshine, and our friends are warm and comfortable. They all run and play together, but the day comes when one suddenly stops and looks into the distance. Their eyes are fixed and intent, their eager bodies begin to quiver. Suddenly one of them breaks from the group, flying over the green grass faster and faster. Size: 5 x 7 & 8 x 10 options available. Our framed photo gifts are made using high quality picture frames that can stand alone or be hung and high quality prints. Our Blue Distressed Wood Frame has a velvet backing. All of our frames have the hardware attached to be hung. Regarding our turnaround time: All orders will be received and processed Monday – Thursday. All orders received from Friday – Sunday will be received and processed on Monday. These are designed for you and it usually takes 2 - 3 business days to completely create a gift and ship it out on your behalf. Please know we will take great care in creating a very special memorial photo gift for your loved one or friend. We are happy to add a hand written note to accompany your gift. Simply let us know what you wish to say.